Backflips are not only interesting but also exciting to show off. In order to do a backflip, you do not need to be a gymnast or an acrobat. Since trampoline has a bouncy surface, you can do a backflip with time. You have to practice regularly, and in the beginning, it might look impossible. But as time progresses, you will be able to do the perfect backflip. All you require is patience. You can also practice moves like backdrops over overcoming your fear and then you can roll back into a somersault. As soon as you start mastering these basic movements, you can start doing backflips. Step 1: You should work with a trusted partner when you are doing a backflip. For the first time, there may be chances of you falling down and getting injured. Work with someone who will have your back and will make you comfortable when you are trying to do a backflip. Step 2: Once you have a partner, you have to start warming yourself up by bouncing on the trampoline. Try to jump around and limber up the legs. Strengthen your stomach, neck and back muscles by performing a set of chin-ups, pull-ups, and crunches. These muscles are going to play an important role when you perform your backflip. Keep in mind that all the trampolines are not similar to each other. So you should be familiar with your trampoline before you go for a backflip, or it can lead to an accident. Step 3: As soon as you finish warming up, perform a backdrop. This means you have to let yourself loose, fall on the trampoline and bounce back up. In case you are not comfortable, try to do a seat drop first. When you feel comfortable, you can try this backdrop and throw the legs over, like a tiny somersault. If you are afraid of the trampoline, backdrops will help you to get rid of this fear. The moves of a backdrop are similar to that of a backflip. Doing repeated backdrops will help you to master yourself before you understand how to do a backflip. You should do a backflip only when you have started getting accustomed to a backdrop. Step 4: Now, you have to come to the center of your trampoline, so that you do not get injured when you perform a backflip. If you try it towards the edges of the trampoline, there are chances that you may land outside, and hurt yourself. Step 5: Start jumping again, and this time if you have to increase your height as you progress. Try to lean backward with each bounce. When you do this, you will understand the correct angle that is required to start and finish your jump. Step 6: When you are sure that you have reached your highest peak, you have to look up at the sky. Then, throw your arms backward. Slowly, take your shoulders, torso, and head behind you. You have to either tuck the legs against the chest, or you can swing them for completing the rotation. Step 7: Once this is done, try to straighten the legs before you can land back on the trampoline. Done and dusted! Follow these steps under the supervision of an expert or at least your elder ones. Mastering this routine manner, you can perform a backflip. There is no need to do a huge backflip. 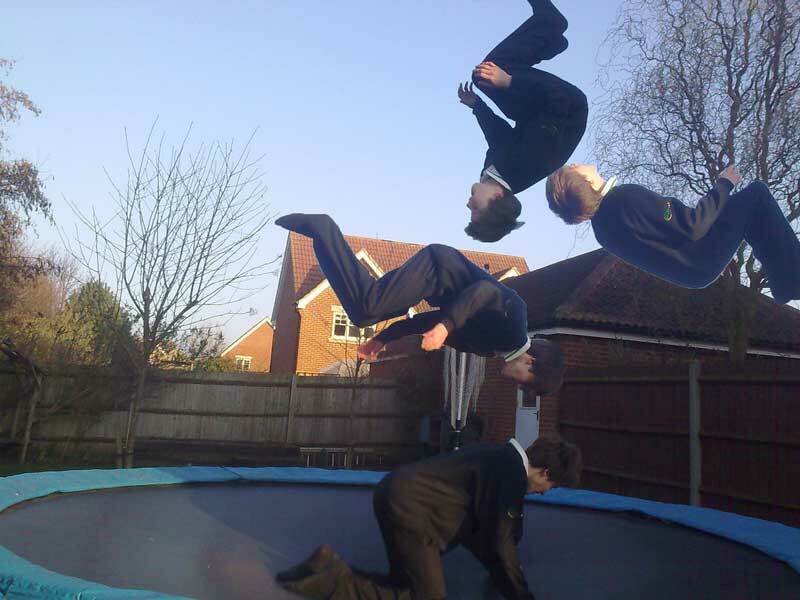 Also, try to keep a huge space on your trampoline when you are doing the backflip so that you do not land on the ground. Try with small backflips and once you are used to it, try taking bigger leaps. Ensure that the partner that you have selected is aware as to how to do a backflip. If he is not, consider making someone who knows a backflip, your partner. Ask your partner to help in spotting you when you are learning how to do the backflip. Ensure that all the other people are off your trampoline. If you fail to complete the rotation, you should not remove your arms from their position in order to prevent your fall. This can be dangerous as your arm can break or get fractured. Maintain the same position no matter how many times you fail. With proper practice sessions, you will be able to master the backflip perfectly. If you lose balance and you are about to fall down, try to fall forward into a frog position, or fall on your back. It is true that backflips are not easy, but if you are flexible enough and you can warm up your body, you will do it nicely. Again, be careful in the learning process.